Fab Foundation started as a makerspace for students as an alternative learning space. They encouraged kids who had learning and emotional support issues to learn through hands-on activities with Fab Labs, which has spaces with industrial-grade fabrication and electronic tools. Through a partnership with Chevron, there are now 10 Fab Labs operating in several school districts across the United States, providing opportunities for kids to innovate and invent. In a recent sit-down with Dan Hedges, Don Martin of Chevron’s Fab Lab Intermediate Unit 1 shared how a student-centered approach has improved their students’ discipline, academic progress and school attendance. According to Martin, shifting to a project-based curriculum allows kids to become inventors, assessing problems and creating solutions, and improving their thought process over time. Kids can sit down with community and business leaders to collaborate, aligning their projects to serve the needs of their community. The mission is to be an educational service agency, teaching kids both hard and soft skills to prepare them for what lies ahead. 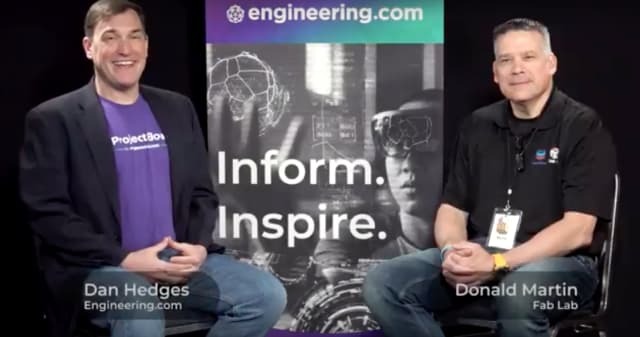 Fab Foundation is collaborating with engineering.com to merge education and engineering for engineering.com’s ProjectBoard. This allows students to work on their ideas outside of school while still getting assistance from their teachers. According to Martin, tapping into engineers’ resources enables educators to better teach engineering and technology to kids. Since technology is consistently evolving, educators need to be at the forefront of available information and tools. Fab Foundation aims to take STEM (science, technology, engineering and mathematics) learning to the next level, preparing both students and educators in an ever-changing society. According to Martin, they’re always thinking about what the future will bring for students, which is why they go beyond the textbooks. “You have to really think outside of the box to help students be successful in the future,” Martin said.